I’m not a big fan of smoked cheese so I don’t know why I thought I might go for this recipe. It’s sort of like going on a date with someone you know you only like as a friend: kind of pointless and a little bit sad. Ok, it’s not that it’s bad. There ARE a number of things I do like about it. Spoon half of pasta mixture into a 13 x 9-inch baking dish coated with cooking spray. 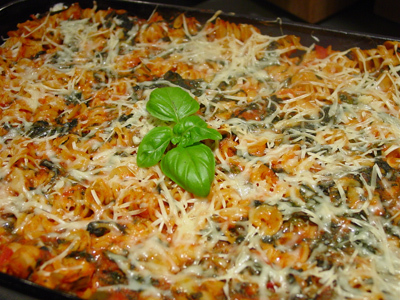 Combine sour cream, smoked cheese, and basil; spread over pasta mixture in dish. Spoon the remaining pasta mixture over sour cream mixture; sprinkle evenly with Parmigiano–Reggiano. Bake for 25 minutes or until bubbly. Let stand for 10 minutes before serving.